Why do I waste time when I want to be writing? There's a Seinfeld episode that holds the key. It was part of my plan today to write a blog post first thing — either a new piece of short fiction or some thoughts about my writing process — but I’ve been procrastinating all day. Part of a Salon.com article about an English teacher whose mother was F. Scott Fitzgerald’s last lover. 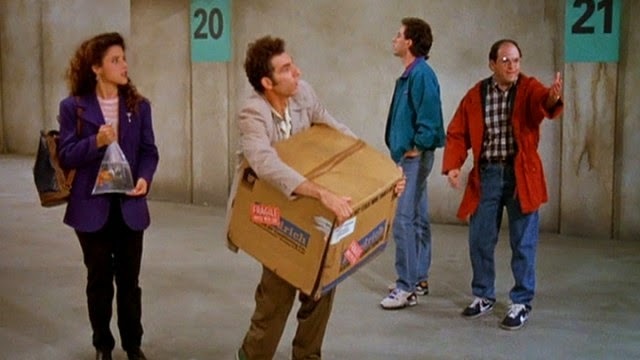 A Splitsider post about the Seinfeld “Parking Garage” bottle episode. A gossip columnist’s take on Selena Gomez’s rude ankle-baring selfie in a Dubai mosque. An NPR story about an English greenhouse that's battling global threats against the cocoa plant. I researched vows of silence in the Catholic monastic tradition. I checked our bank account balance. I scrolled through my Facebook and Twitter feeds in search of new reading material on top of what I’ve already read today. But none of that was what I set out to do this morning, and so this detour becomes what I want to talk about instead. "The Parking Garage" episode of Seinfeld. But is it? Not usually. What is more rewarding than sticking to your commitment to write? What is better than the faithful pursuit of your craft? What gives more pleasure than knowing you are doing what you were made to do? Next time I sit down to a blank page, I’m going to hold onto the memory of this moment and that wisdom from Seinfeld. And I’m going to close my web browser and buckle down to work. Read more posts in the Storytelling Sunday series here.